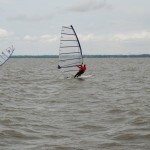 The 2009 Walleye Wagatta windsurfing race was held on Lake Winnebago in Fond du Lac, WI last weekend (May 9-10) off of Roosevelt Park. 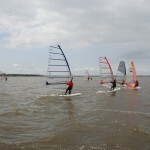 This event was put on by the Wind Power Windsurfing Center as part of the MOWIND Race Series and 17 sailors from WI, MN, IA, and IL were in attendance. Saturday racing conditions were overcast with 10-15 mph winds and intermittent rain. Still, six races were completed and competition in the A-Fleet was tightly contested between Andy Gratton of Oshkosh and Don Altmyer of Taycheedah, with Peter Hartwich of Excelsior, MN in third place. The Sport Fleet was also tight with Mark Schmitz of Fond du Lac, Greg Anshus of Rochester, MN, and 13-year-old Magnus Zaunmueller of Beaver Dam as the top three after the first day. Racing resumed Sunday morning to brighter skies and light winds. Fortunately the winds increased just prior to racing, and four more races were completed in 15-20 mph winds. Gratton and Altmyer continued their battle and ended the regatta tied for points, with Gratton taking the title on a tiebreaker (he had five 1st place finishes to Altmyer’s four). 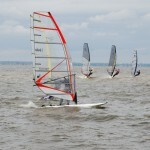 Hartwich continued his strong sailing to finish in third place. In the Sport Fleet, Magnus Zaunmueller came on strong to win all four races in the higher wind to close the gap on Schmitz, also resulting in a tie at the top of the Sport Fleet. Magnus won the tiebreaker with all four of his bullets coming Sunday to give him the title with Schmitz finishing second overall (two first place finishes). Third place went to “Low Boom” Larry Reed of Des Moines, IA after he came on strong in Sunday’s racing. 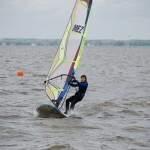 A Workshop Fleet was also offered during the event, and 12-year-old Niels Zaunmueller (brother of Magnus) was the only participant to brave the challenging spring conditions. He showed remarkable board control and was able to successfully navigate the courses throughout the weekend. We look forward to seeing more from him as he moves up the fleets. Del Carpenter won the event raffle and is now entered as a season finalist in the 2009 MOWIND raffle for the following three prizes: a KA Speed Sail, a GT-31 GPS (with memory card and Aqua Pak carrying case), and a cutting-edge wind meter. 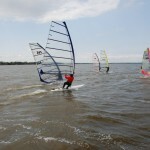 The next race in the MOWIND Race Series is The Dam Jam in Des Moines, IA May 16-17, 2009. 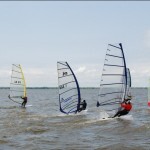 The MOWIND Race Series returns to Fond du Lac September 19-20 for the Wind Power Championships which are also part of the US Windsurfing National Race Tour. 12-year-old Niels Zaunmuller completing the Workshop course. Andy Gratton tries to avoid a fall as he tacks towards the finish with Don Altmyer. One more start at the 2009 Walleye Wagatta.